The fourth quarter of 2018 was notable as states like Connecticut doubled their dispensaries from nine to 18 while Oklahoma went on a spree issuing 162 caregiver, 805 dispensary, 1,302 grower, and 341 processor licenses by year end. 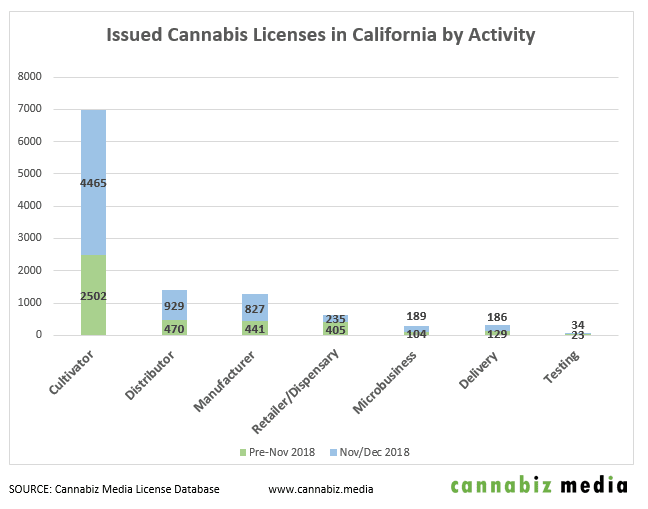 However, all this pales in comparison to California, which issued 6,855 new licenses between November 1, 2018 and year end. The regulators talked throughout the fall that their staff was going to be working nights and weekends to process the last of the temporary licenses, and it appears they were true to their word. 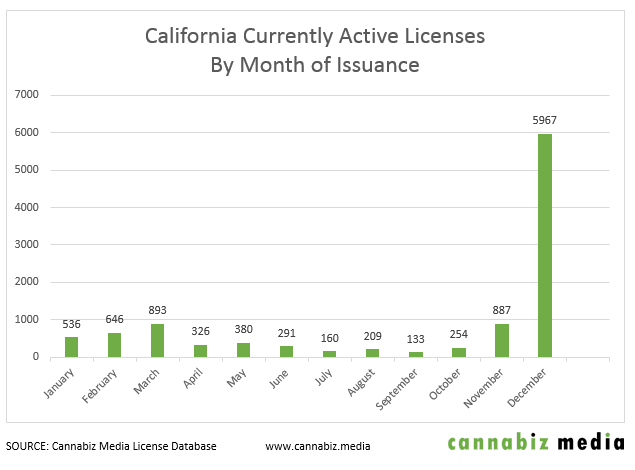 California has 10,940 active licenses, though only a few dozen are annual licenses. This count does not include 149 event licenses. As of October 31, 2018, there were approximately 4,085 active licenses, including 257 issued in late 2017. Over the next two months California more than doubled that count by issuing 6,855 more. 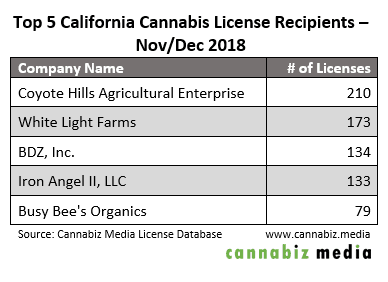 The California Department of Agriculture issued the vast majority of these new licenses: 65%. 45 license holders garnered double digit licenses during this period and accounted for 1,665 of the 6,855 (24%). As we have documented over the last 13 months, cultivators are stacking licenses to create large cultivation facilities. You can see the top five companies that received licenses during the last 60 days in the table below. 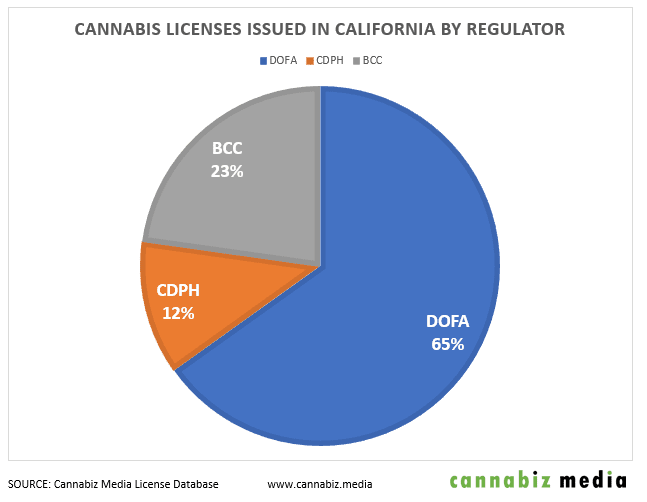 California Department of Food & Agriculture (DOFA) regulates cultivators and has issued the most licenses. Bureau of Cannabis Control (BCC) regulates retailers, testing labs, distributors, microbusinesses, and delivery. It authorized almost a quarter of the licenses. California Department of Public Health (CDPH) issued 12% of the licenses to manufacturers. The chart below provides a deeper dive into the licensed activities. 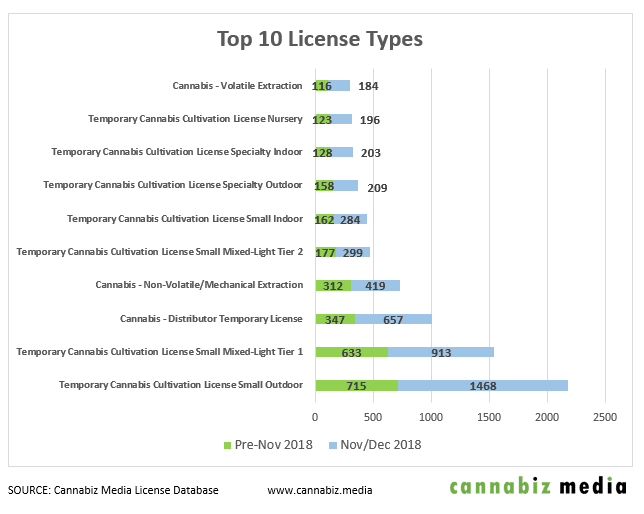 In comparing licenses issued by activity, many categories almost doubled like distributor at 198%, manufacturer at 188%, and cultivator at 178%. Retailers only increased by 58% and testing labs by 68%. The state of California has a myriad of licenses that it offers to cannabis businesses. The licenses of choice during the recent issuance were for cultivation and manufacturing. 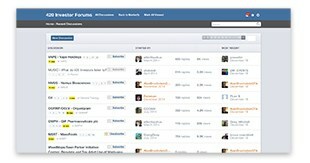 The top 10 are shown in the table below. 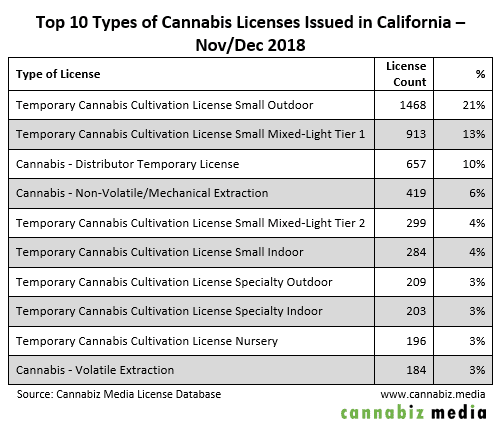 Compared to the first 10 months, the list is similar except that the Small Outdoor licenses accounted for 21.4% of the new licenses up from 17.5% of licenses issued in the first 10 months of the year. 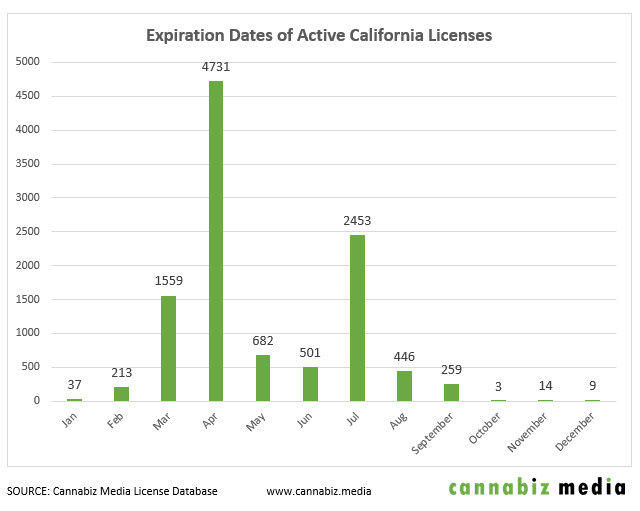 Since California ceased issuing temporary licenses, the license onslaught has ebbed. We will monitor the disposition of these licenses as they migrate to become provisional and annual licenses. There are some expiration date peaks on the horizon that will confront regulators and license holders as shown in the chart below. 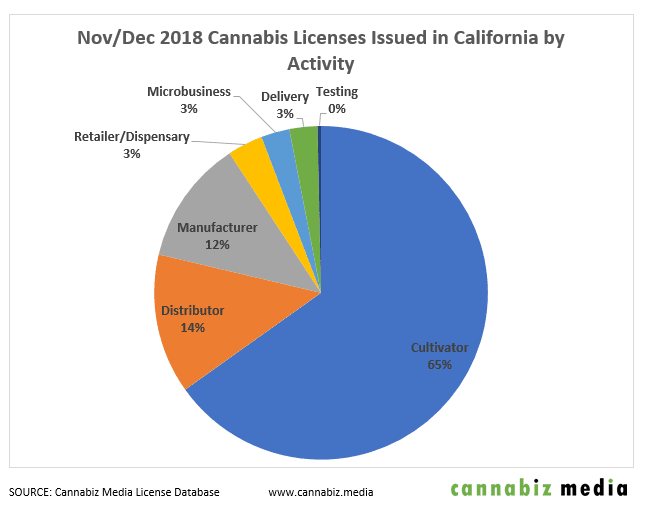 With a year of regulation complete and the newly approved state regulations for cannabis businesses, California and its license holders should experience a more stable year. This year will come with challenges as license holders work on their annual licenses, connect to track and trace, and pay application fees and of course, taxes. Ed Keating is a co-founder of Cannabiz Media and oversees our data research and government relations efforts. 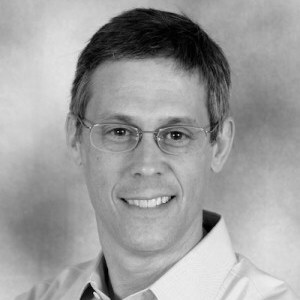 He has spent his whole career working with and advising information companies in the compliance space. Ed has overseen complex multijurisdictional product lines in the securities, corporate, UCC, safety, environmental and human resource markets and focuses on workflow products. Ed has spent the last twenty five years in the information industry. During that time he has worked for both startup and established information companies where he has led marketing, product management and sales organizations. These companies include Wolters Kluwer/Commerce Clearing House, CT Corporation, EDGAR Online and Business & Legal Reports. At Cannabiz Media Ed enjoys the challenge of working with regulators across the country as he and his team gather corporate, financial, and license information to track the people, products and businesses in the cannabis economy. Ed graduated from Hamilton College and received his MBA from the Kellogg School at Northwestern University. He has been active with the Software & Information Industry Association for his whole career and managed the Content Division for six years. He’s was recently a Trustee at the Country School in Madison CT and a Little League Coach for seven years.